Introducing the CA-2988, the first 2.0 USB-powered computer speaker as portable as your lifestyle. The 2" full range drivers make your listening experience the best it can be. Sporting a unique magnetic clamp together system, the speakers become easily packable and take up as little room as possible for people on the go. Because the speakers come with a handy carrying pouch, you’ll never have to worry about damaging your speakers. Don’t let your traveling get in the way of awesome sound. Compatible with Mac, PC, Chromebooks, and USB tablets. CONVENIENT AND VERY PORTABLE: Designed to magnetically clamp together for easy toting in the included travel bag. 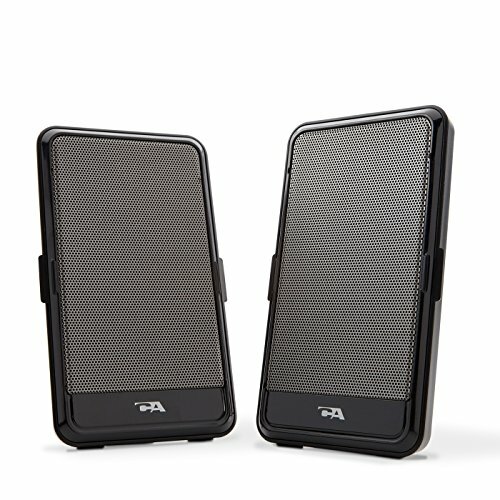 USB POWERED WITH 3.5MM AUDIO: These USB powered laptop speakers use a 3.5mm audio input connection to deliver a great listening experience on the go. TWO INCH DRIVERS: Strong 2" speaker drivers deliver great sound in a compact form. COMPATIBILITY: Works with laptops, MacBooks, PC computers and other devices with USB and a 3.5mm audio/headphone jack.